Item Number: 166-6-24 17198 Actual Weight: 0.4 lb. 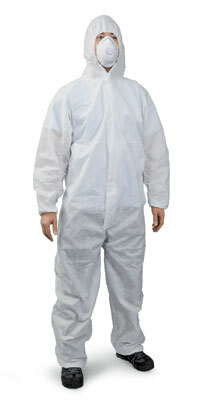 Lightweight coveralls provide protection against non-hazardous particulates, chemicals and liquids. Strong, spunbond polypropylene material provides protection, breathability, and comfort. Elastic on wrists, ankles, and hood helps keep coveralls in place. Fits up to a 6'7" and/or 290 lb. person. Respirator masks sold separately.